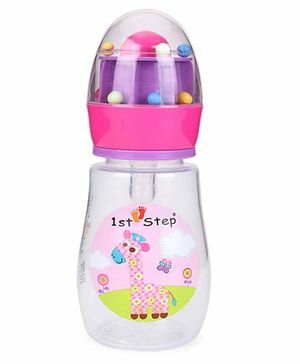 1st Step presents feeding bottle essential for feeding babies when breastfeeding is no more possible or needed. Standard neck feeding bottle. Streamlined and elegant shape. Ergonomic design enables easier feeding with every considerate particularity. The bottle also features a cute giraffe print along with an attractively designed bottle cap. quality is very good. superb. cap is little bit weight.